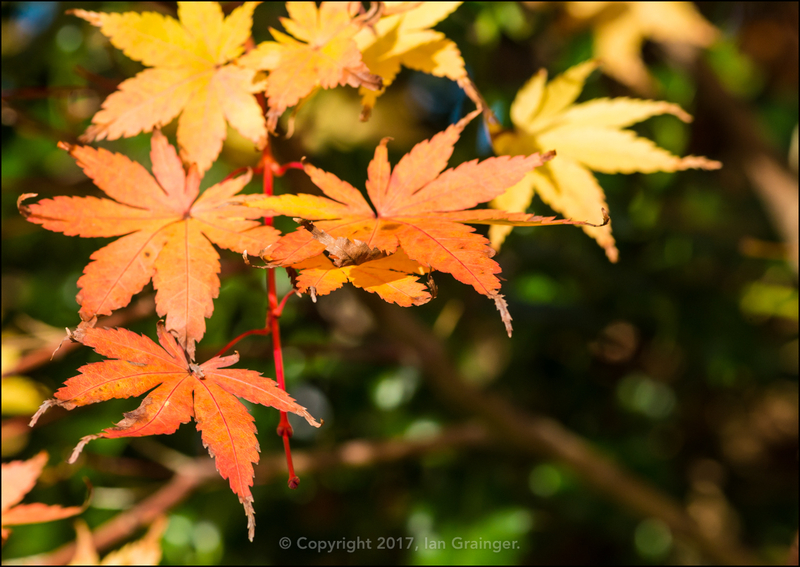 The sun was out, the skies were blue, and it was my Birthday for this week's photo shoot in dad's garden. The problem was that it was bitterly cold, and it was blowing an absolute gale - so not ideal for any sort of macro photography. However, I persevered, and ended up with a handful of shots I was pleased enough with to post here. 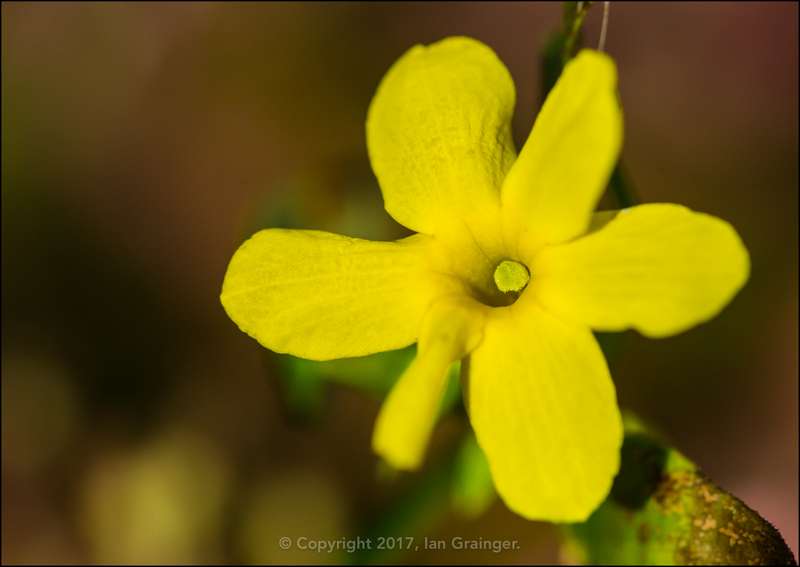 The first of which was a pretty little Winter Jasmine (Jasminum nudiflorum) bloom. There weren't too many of them about, but the ones that I could find were looking rather pretty. 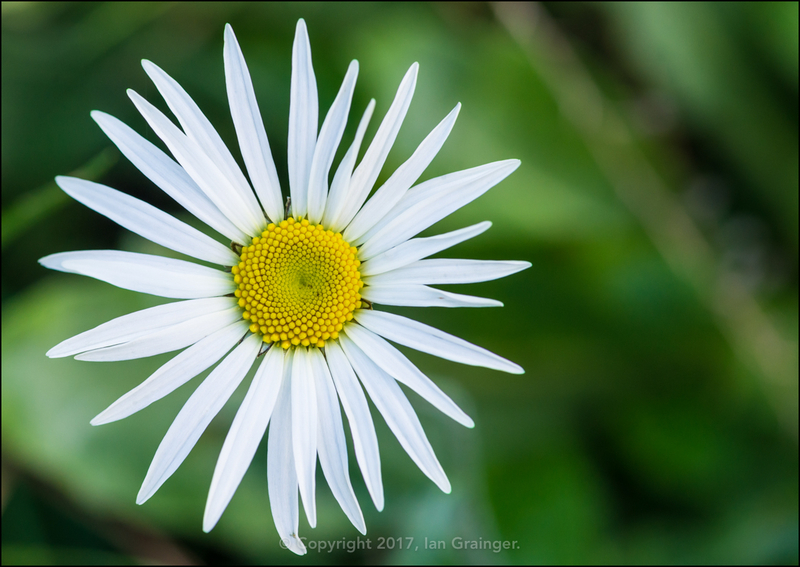 ...the same was true for this Oxeye Daisy (Leucanthemum vulgare). I must have taken about twenty images just to get this one sharp one! 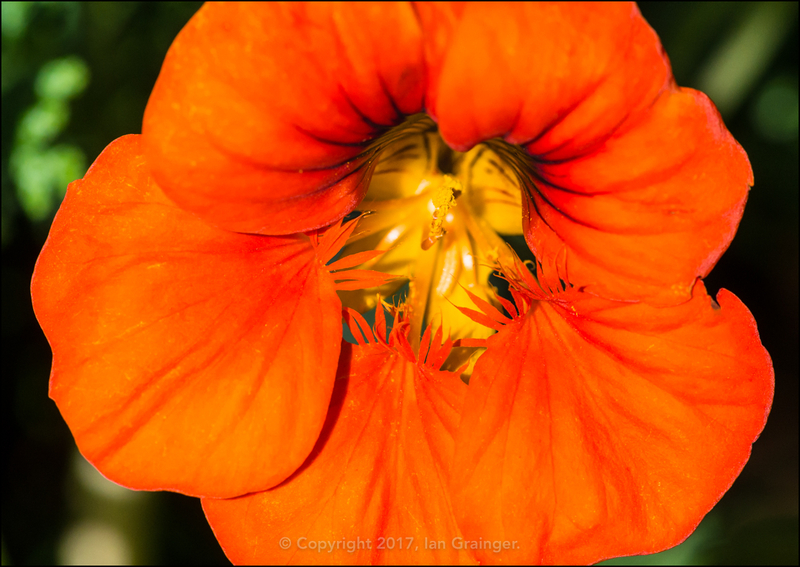 The Nasturtiums (Tropaeolum) were a bit easier to photograph, as they were either supported against a trellis, or were growing along the ground. They hardly moved at all. 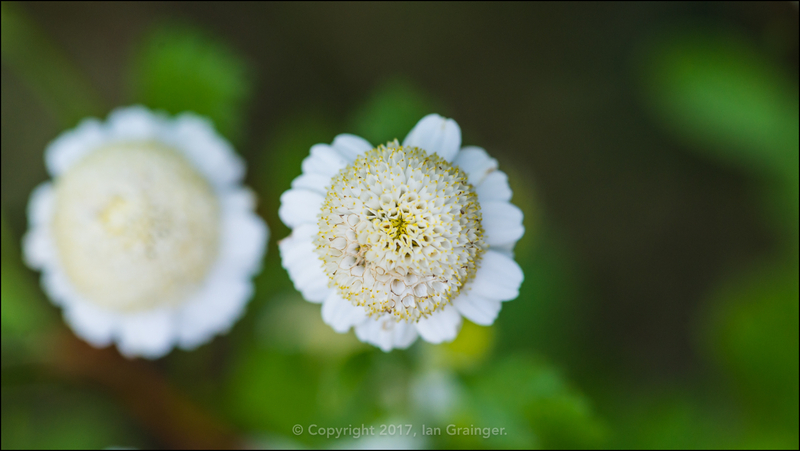 I was quite surprised at how sharp this Feverfew (Tanacetum parthenium) image turned out, as the wind didn't let up the whole time I was trying to shoot it. I actually gave up, and nearly deleted the image after looking at it on the back of my camera. Thankfully I didn't as it's actually pin sharp. 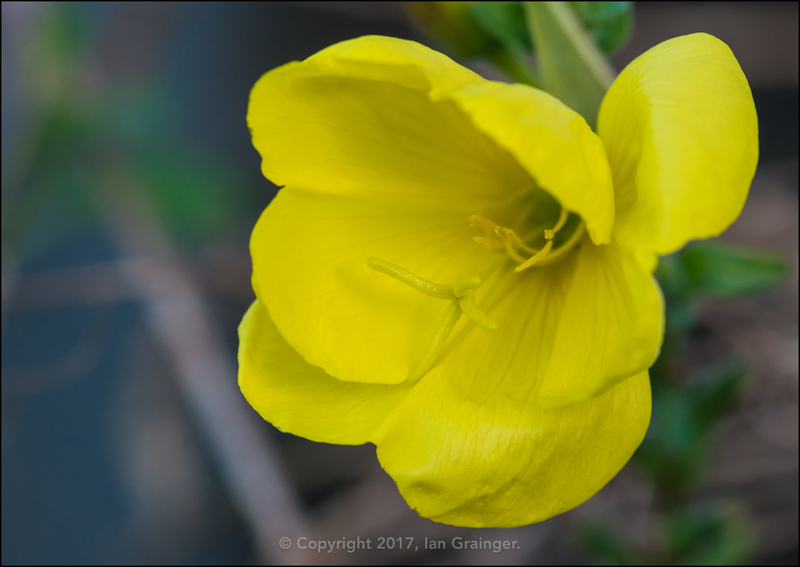 Trying to get some shelter from the wind, I wandered off into a corner of the garden that was mostly surrounded by tall shrubs. The only problem there was that it was a lot darker than the rest of the garden, which presented a different problem! 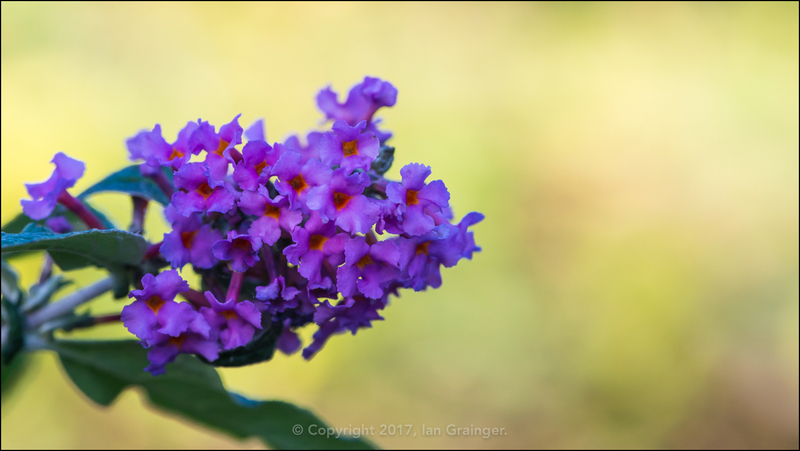 Again, I persevered until I got a shot of this very deep coloured Butterfly Bush (Buddleia) bloom. 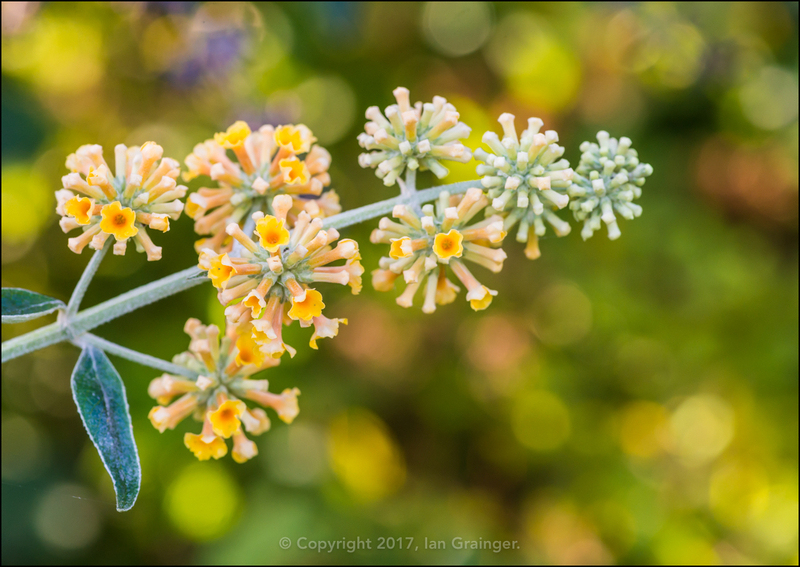 In the same corner I came across the buds I photographed last week, and here they were turning into blooms. So here's their picture as promised. 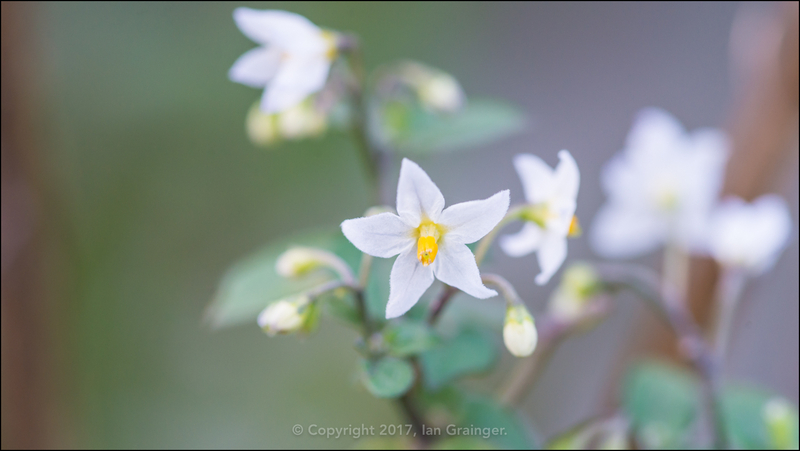 After hunting high and low, the only other flowers I could find were this Potato (Solanum tuberosum) blossom. So, my search moved on from blooms to berries. 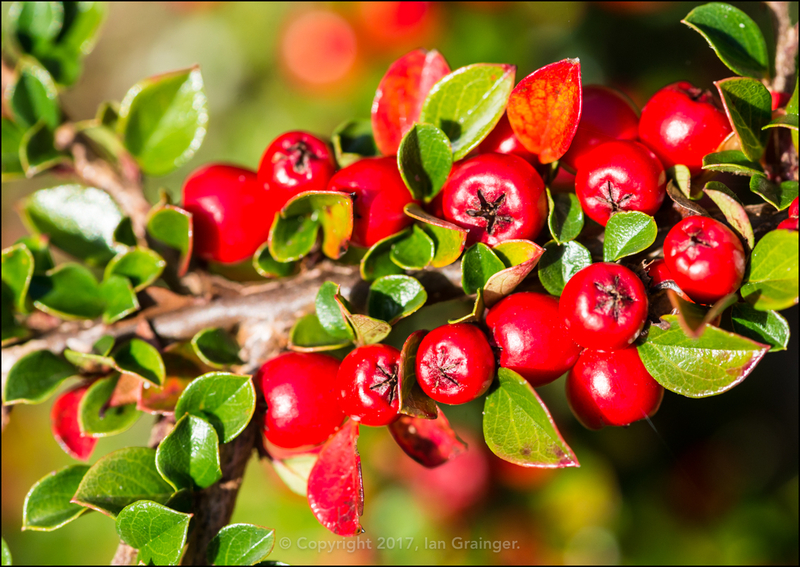 The Cotoneaster bushes had been loaded with berries for a couple of months now, and they seemed to be getting redder and redder by the week. 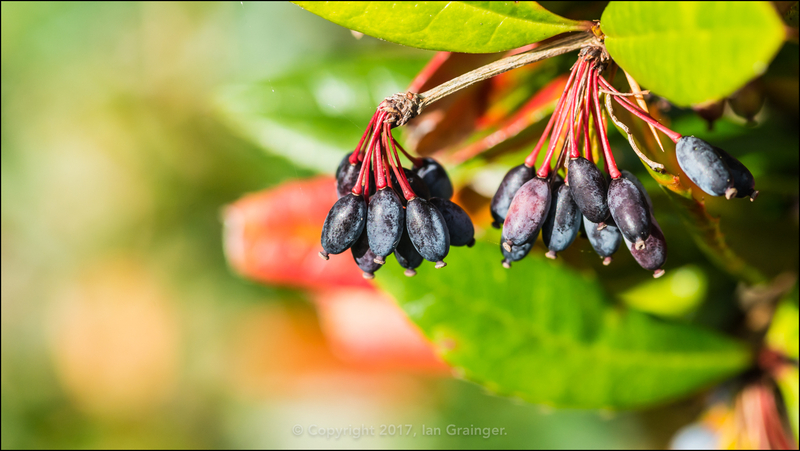 I found these strange looking clusters of berries living in a hedge owned by dad's next door neighbour. I have no idea what they are, but thought they looked interesting enough to include. If you know what they are, please leave a comment below. Thanks. 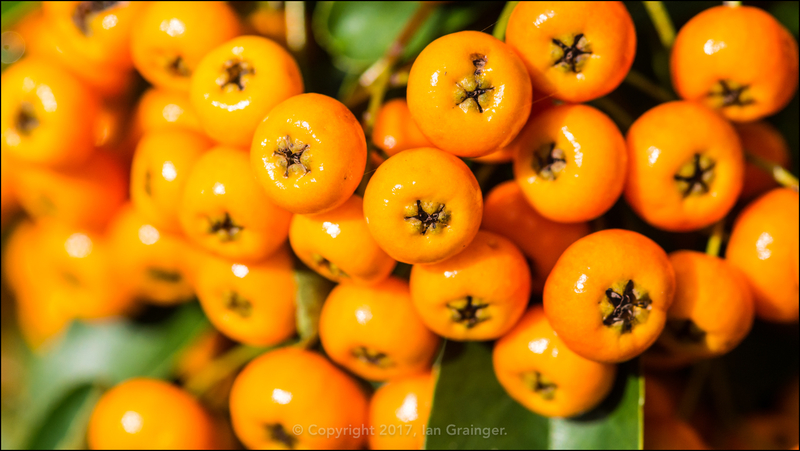 The Firethorn (Pyracantha) bushes were absolutely loaded up with berries that had slowly turned from yellow to orange over the past month. 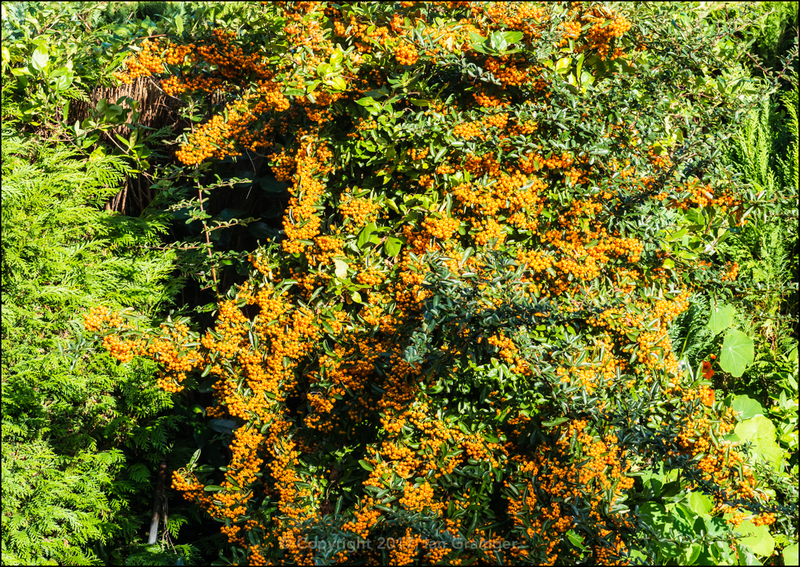 Here's a wider angle shot of the bush showing just how many berries there were. 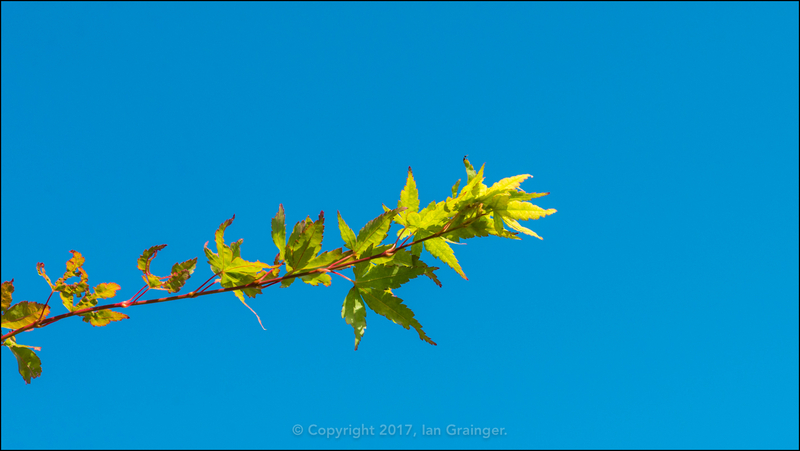 ...but a few were still hanging onto their Summer colours. Just look at that blue sky. Who would have thought it was blowing a gale, and the temperature was less than 10°C? 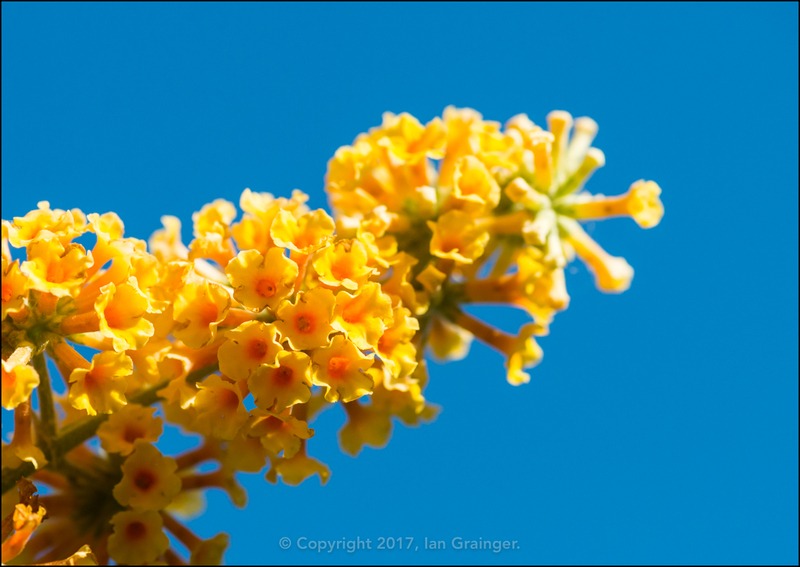 The yellow Butterfly Bush flowers definitely looked lovely against the bright blue of the sky. As it was so windy, there weren't too many birds risking a flight. 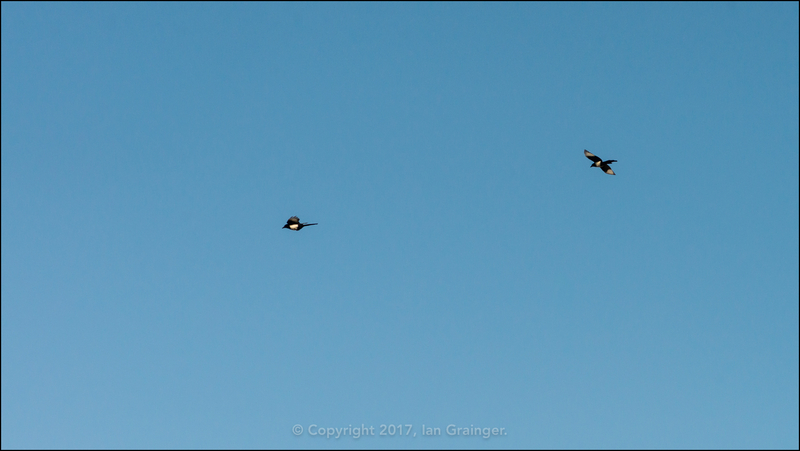 However, I did catch these two Magpies (Pica pica) zooming along overhead. Finally, my underwater friends. 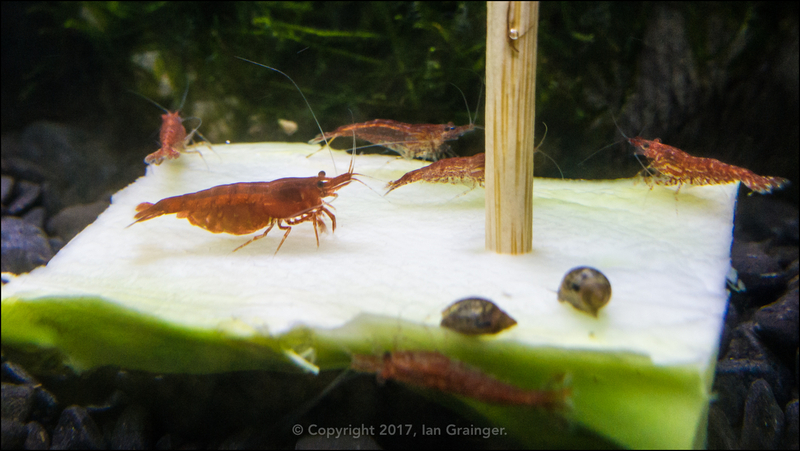 This week I thought I'd try feeding my Red Cherry Shrimp (Neocaridina davidi) something new. I ended up trying a sliced up piece of broccoli stalk, and it seems to have been a bit of a hit! I was really pleased to see how well they took to it. I was even more pleased when this large female came into view, and saw that she was full of eggs. I've got my fingers crossed that the eggs will hatch successfully and that I've got a sustainable breeding colony!